Despite a stellar preliminary earnings report, the gaming-headset leader had a bad month. Shares of Turtle Beach (NASDAQ:HEAR) lost 11% in October, according to data provided by S&P Global Market Intelligence. For perspective, the S&P 500 lost 6.91% last month. Even after last month's decline, shares of the leading maker of gaming headsets have delivered an incredible return of more than 1,000% year to date. It was a wild ride last month for Turtle Beach shareholders. The stock drifted down more than 10% early in October along with the broader market. Then, on Oct. 11, the company issued preliminary results for the third quarter, which sent the shares back up to positive territory. 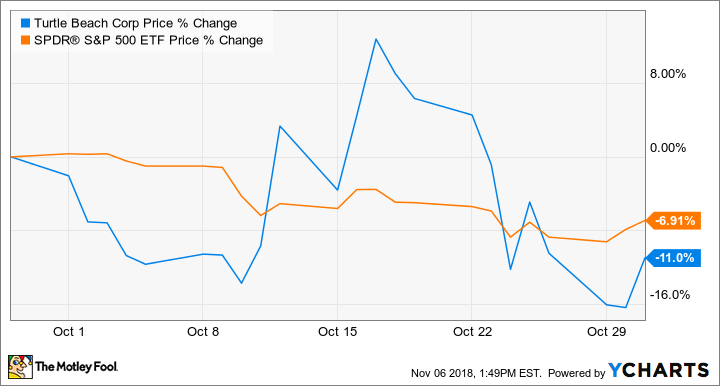 But the stock took a nosedive in the last week of October following a disappointing outlook from rival peripheral maker Logitech International (NASDAQ:LOGI), which sent Turtle Beach stock into the red to close out the month. Investors often look to competing companies in the same industry for clues on what to expect ahead of earnings results. Investors have been very optimistic about the growth prospects of computer peripheral makers as these companies benefit from growing sales for headsets, keyboards, and mice based on the surging popularity of online multiplayer games like Fortnite. Apparently, Turtle Beach investors didn't like the fact that Logitech didn't raise its forward guidance despite better-than-expected growth in the last quarter. Some may take that as a sign that future growth for gaming peripherals is not as strong as investors hoped for. Nonetheless, it doesn't appear Turtle Beach investors have anything to worry about. The company's preliminary report in October points to another blowout quarter. Based on continued strong sales of gaming headsets, Turtle Beach expects to report revenue growth between 103% to 106% year over year, and revenue between $73 million and $74 million. Earnings are expected to range between $0.74 and $0.78 per share, representing a significant improvement over the year-ago loss of $0.04 per share. What's more, the report noted that the company plans to raise the full-year outlook during the upcoming conference call to discuss third-quarter results. Investors will get the full story when Turtle Beach reports its third-quarter earnings on Tuesday after market close.